See Mike's alter ego, Ben, on You Tube. Books. UFO/Alien. Sites to Educate, Uplift and Amaze. Radio. Sites We Like. I Was Abducted. The place to report or read about alien contact. The Lightside. The LIghtside UFO Study Group. International UFO Congress. Home of the world's largest UFO conference. Taken Into The Sky. " Home of the abduction newsletter...are you one of the taken "
Alien Observor. 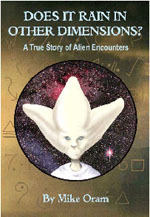 Information on and links to all things alien and UFO related.